Jostec offers complete production line solutions tailored for the needs of the customer. From starting with the rolling of the dough to finishing with the loading and handling of the baking trays. Our equipment is suited for diversified handling and treatment of doughs, from trendy, gluten-free thin bread doughs to traditional yeast doughs. 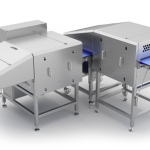 We offer solutions for forming the dough, decoration and fermentation and the handling of the baking trays. We will design and build a production line that fits the needs and demands of the customer. We aim to expand capacity and optimise the bakery premises by designing a bespoke line for efficient prodution in collaboration with our customer requirements. 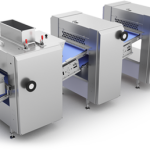 Roll-out sheet feeder optimised for wet and gluten free doughs. For example, crispbread, gluten free pizza. Thickness 1-5 mm. Homogenisator as an option, for mixing of new and rest dough. Make-up table with numerous accessories. 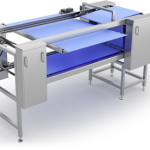 Roll-out sheet feeder for dry and gluten free doughs with calibration. Dough sheet 1-8 mm. Suitable for various hard and dry doughs, for example laminated pie and pastry doughs or gluten free and calibrated doughs. 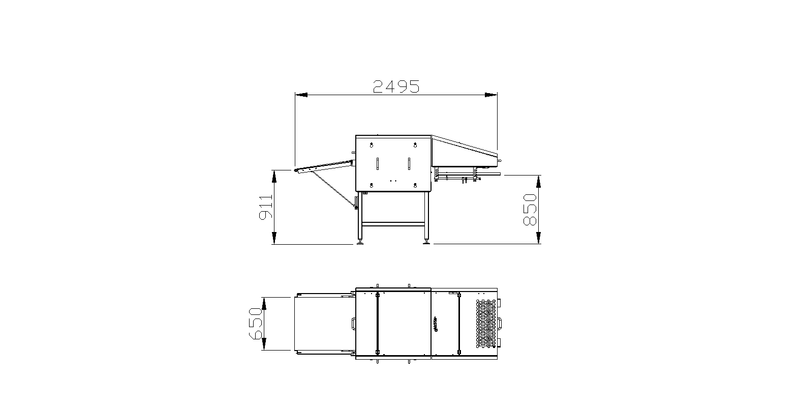 Gentle roll-out sheet feeder for wheat doughs. Handling in several stages with intermittent rest/prove phases. Suitable for yeast-based doughs, for example rolls and soft buns. Thickness of the dough sheet min. 2 mm. 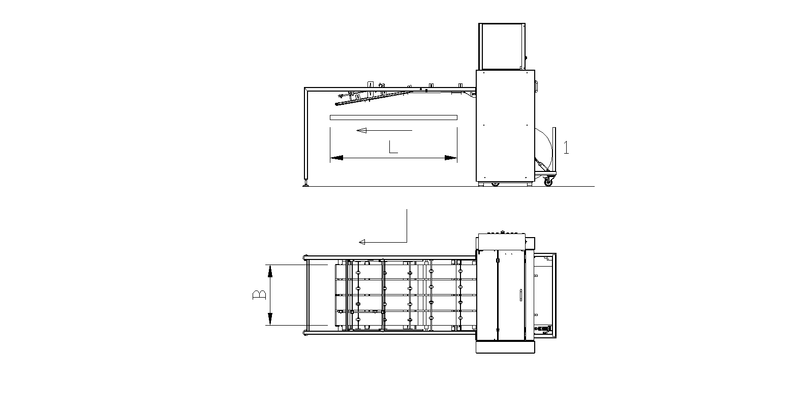 Roll-out sheet feeder for wet and loose doughs. Cuts the dough band into single pieces. After several phases of handling and rest/proving, the dough will retain its rising properties and generate the best result. Excellent for ciabatta doughs and rolls. Thickness of the dough sheet up to 2 mm. Make-up table with all necessary features. The length of the table is defined by the chosen accessories. Cutting, turning, folding, rolling, filling with jam, surface decorating and space for manual handling. Surface decoration unit as part of the production line. Sprinkling, brushing with egg, pasting and seeding, also available as an option re-circulation of surplus decoration material. Single way loading system, which fills the trays or a transversal cross conveyor. Fills the tray in a single motion, for example, after the roll moulding machine. It is possible to adjust the conveyor speed, the filling distance and the filling delay. The standard equipment offers a filling distance of, at most 700 mm and a conveyor belt width of 650 mm. 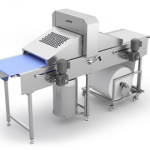 Two-way loading system, which fills the trays in both longitudinal and transversal direction. You will get full benefit of a diversified production by using a two-way loading system. The filling distance is up to 700 mm and conveyor belt width up to 650 mm. Pulling tray loading system for industrial applications. 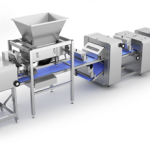 Fills the peel boards or conveyors of the filling system. Suitable for direct oven feed equipped with a grate conveyor. Filling distance up to 4 mtrs. Handling of trays after the production line. Lifting of trays from the trolley, covering the tray with parchment paper – the products are transferred to the tray – filling of the baking surface and automatic transfer. 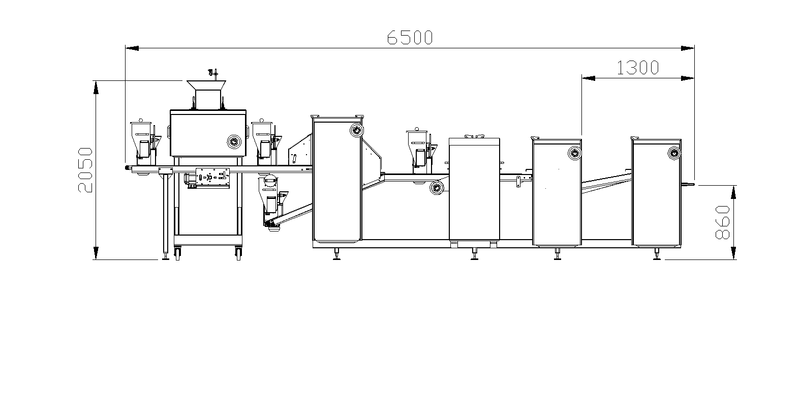 Capacity up to 800 trays/h. Suitable to a limited extent for baguette trays and moulds. 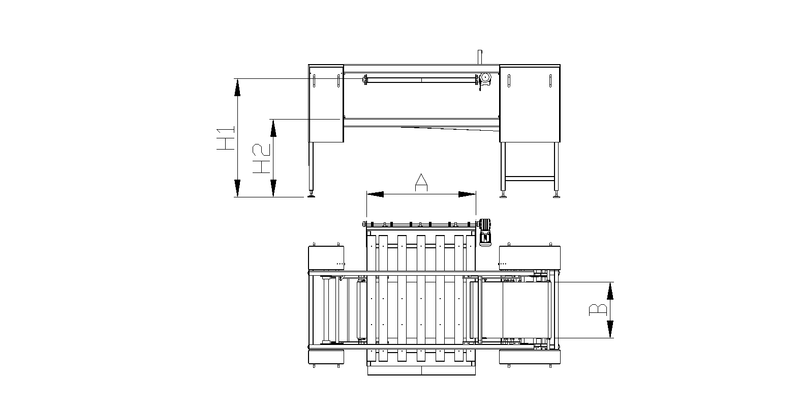 Continuous parchment paper feeder for the production line. The raw dough pieces are placed on the parchment paper and the paper is cut between the product rows. The product group on the cut paper will be transferred to the next treatment step. Equipment for feeding of paper onto trays and peel boards. Suitable for closed circuit tray handling systems. Width of the paper roll is 800 mm and length of the tray up to 2 mtrs. Reliable and durable cooling spiral. External transmission enables almost any variations of feeding and output of the products. Thickness of the dough sheet 1 – 5 mm. The width can be varied within 300 – 600 mm. No additional calibration. Suitable for example for crispbread and gluten free pizza. Treatment of the dough sheet, for example seeding, pricking, cutting etc. Homogenizer as option for mixing rest dough and fresh dough and eliminating air bubbles. 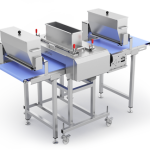 A multi-step, roll-out sheeter for thin dough sheets. Feeding unit and two calibration sheeters. Sprinkles flour both on the surface and under the bottom. Minimum thickness of the dough sheet around 1 mm, depending on the dough type and the needs. 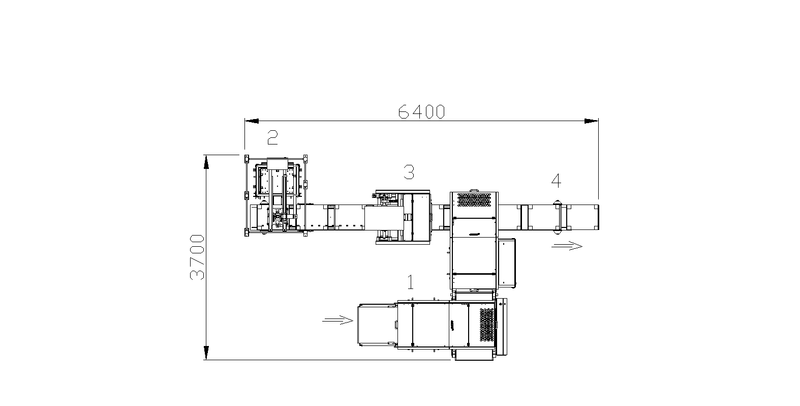 Standard width of the dough sheet 600 mm, other dimensions on request. Standard output speed around 2 – 7 metres/min. Rolls out for example crispbread and laminated doughs for pies and pastry. Suitable also for handling of gluten free doughs. 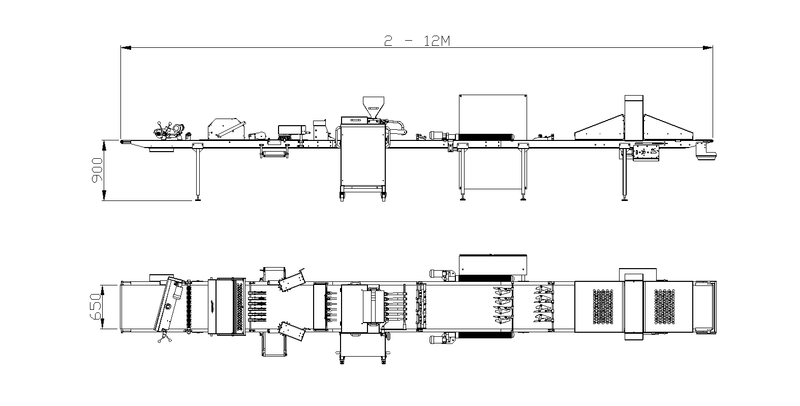 Roll-out sheeting line for yeast doughs. An efficient and gentle production line for yeast and other gluten containing doughs. Suitable for example for buns and rolls. The feeding unit gently forms a thick initial band to save the rising capacity of the dough. A short period of rest followed by satellite roll-out sheeting, traverse roll out and calibration. When necessary two calibration phases as in the illustration. Minimum thickness of the dough sheet around 2-3 mm, depending on the doughs and the calibration. 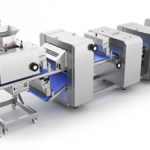 A multi-phase and step roll-out sheeter treats the dough gently and in an optimal manner. The dough is divided in the first phase and the parts are put into a line. After pre-sheeting the dough will be moulded by a satellite sheeter. Thereafter traverse sheeting and two calibrations. Amount of treatments according to needs. Also, the number of flour sprinklings is optimized. Plastic, removable sheets and oil lubrication can be added to the bowl. Thickness of the dough sheet is 2 – 15 mm. Nominal width 600 mm. The versatile make up table is adapted for many various needs. Suitable for brushing, prickling, cutting into shapes or strips, removal of scrap dough, sprinkling of the edge, filling with jam, folding of the strip band, rolling, decorative cutting and transverse cutting. The production line length can be designed from 2-12 m.
A wide range of accessories at your disposal. The cutting-edge selection enables decorative cutting of the products. The table can be delivered as free standing or as a part of the production line. Standard height of the table is 900 mm and the conveyor width is 650 mm. Other dimensions are also available. Water sprinkling with water mist. Egg brushing with a plate brush. Recycling of surplus seeding as an option as illustrated. Seeding can be directed precisely towards the product rows. Length of the equipment 1,5 metres or more, depending on the number of pockets. Standard width 600 mm. Connected to the production line, controlled from the operating desk of the line. The conveyors are made either as belts or as grates. The conveyor is divided into sections, which prevents mixing of materials. The machine is equipped with lockable wheels. Transport to the cleaning room is easy. 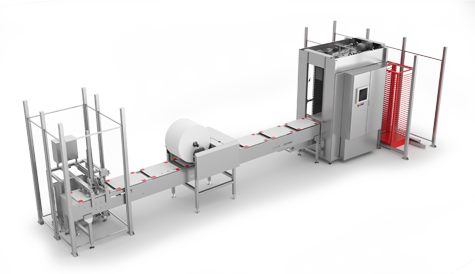 A solution for one-way filling needs, for example after a roll machine or when the tray can be moved. The photo shows an adjustable tray rack. The tray can be filled longitudinally or crosswise. Filling can be adjusted according to belt speed, filling distance and delay. Filling distance 200 - 700 mm with standard equipment. The belt width is 650 mm with standard equipment. Several different dimensions are available on request. Transmission of the belt via a toothed belt, which makes filling silent and gentle. The open design enables easy daily cleaning and maintenance when needed. 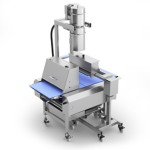 The filling unit can be connected to the production line or it can operate independently. (Control unit not shown in the picture). 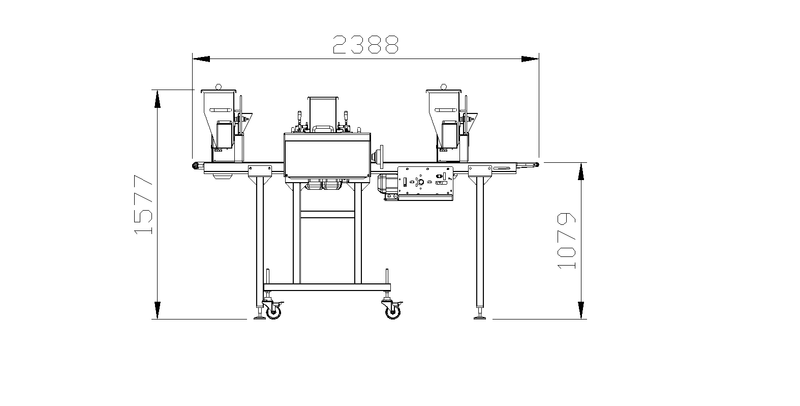 The length of the equipment depends on the height difference between the feeding unit and the filling level and the inclination angle of the belt. Fills the tray in both longitudinal and traverse direction. 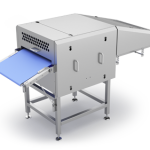 The filling unit makes it possible to fill the tray optimally and without touching the products by hand. The line can be left or right hand orientated. Standard belt width is 650 mm and the maximal filling distance is 700 mm. The synchronous conveyor included in the equipment is equipped with lockable wheels, which makes it easy to uncouple for cleaning. Connections with quick couplings. The synchronous conveyor transports the products on a grate. Belt drive via a toothed belt, which makes the filling silent and gentle. The open design enables easy daily cleaning and maintenance when needed. 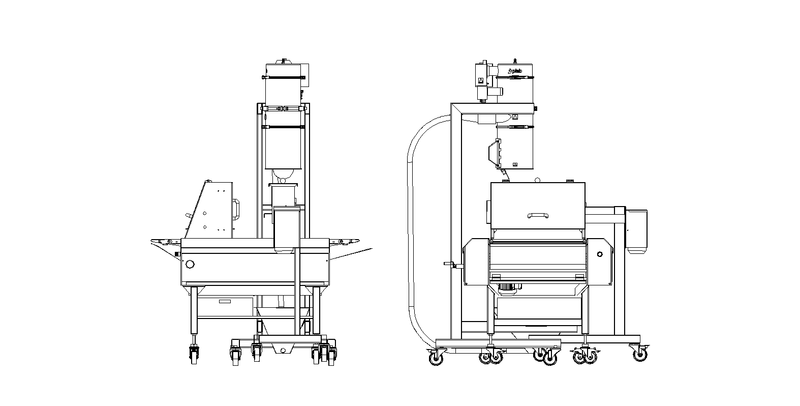 The filling unit can be connected to the production line or it can operate independently. 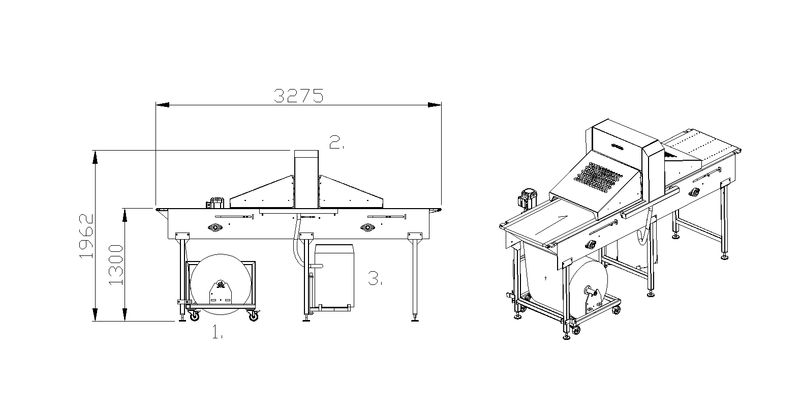 A filling unit for industrial production, aimed for transport of the products to the prover or directly to the oven. Optional standard belt widths (B) 400 and 650 mm. Wider belts on request. Maximal width 1,5 metres. Pulling distances (A) from 1 metre up to 4 metres. Fills the boards of the prover or the tunnel prover or directly to the oven on the grate conveyor as in the picture. The filling method can be chosen according to the product row, the product group or the total width. Filling levels (H1) and spaces (H2) and orientation of the line are selectable. The filling unit includes a rising filling tip and automatic control of the belt. Replaces heavy and boring work operations. The raw dough pieces are transferred from the production line to the filling unit (1), which arranges a convenient filling batch. The baking trays from the tray lift (2), where the tray trolley is delivered. Automatic lifting of the trays to the conveyor (4). In the photo a parchment paper feeder (3), which feeds paper onto the trays before filling the products on the trays. 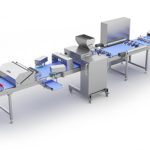 It is possible to add an automatic surface filling device after the conveyor and an attached transfer unit. 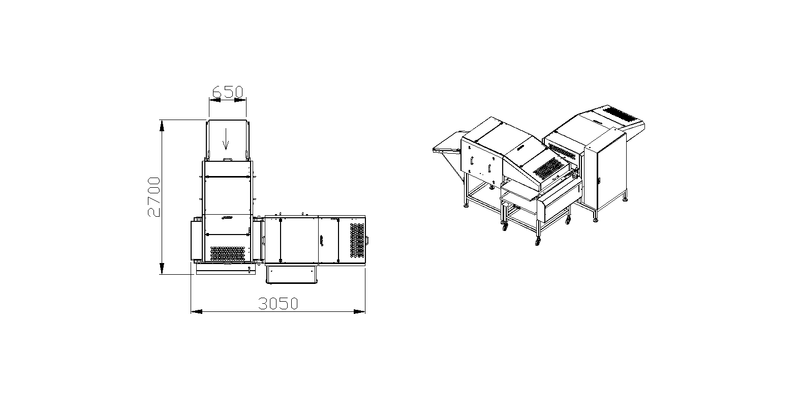 Capacity with paper feeder around 350 - 400 trays/h, otherwise more than 500 trays/h. 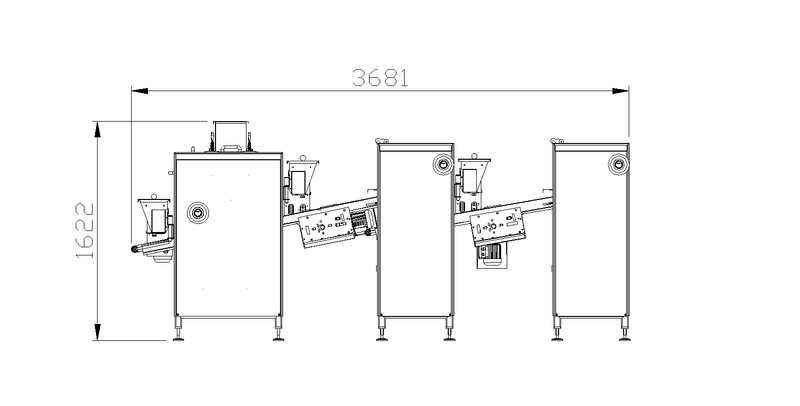 The dimensions of the illustrations are based on tray size 450 x 600 mm and a standard filling unit with 650 mm belts and 700 mm filling distance. The whole equipment is connected to the same control panel with touch control logic. 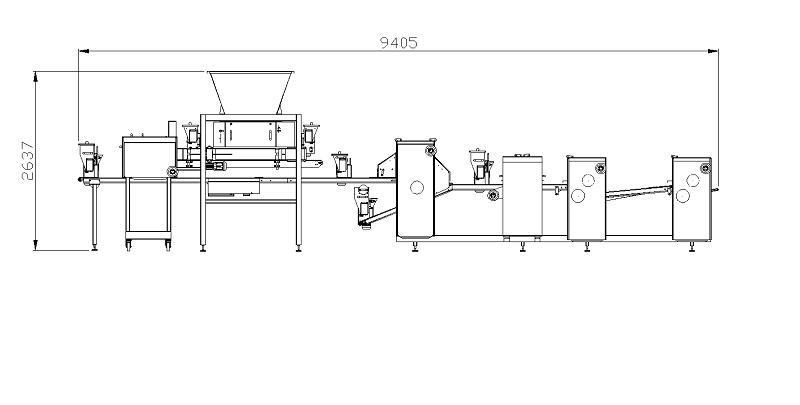 A paper feeding unit to be placed after the production line. - The raw dough pieces coming from the production line are addressed to the conveyor of the paper feeder. - The paper is released from the roll (1) as a continuous band. - The paper is cut by a guillotine (2) to a defined length between the product rows. - The paper is held towards the belt by vacuum (3). - The products will be transported on the cut paper to the next belt for further treatment. The width of the paper roll is 300 – 800 mm. The maximal standard diameter of the roll is around 700 mm. 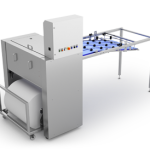 Paper feeding unit for a closed tray or peel board line. Will feed paper onto the empty tray simultaneously as the tray is transported out through the corner. The products are placed on the tray immediately after paper feeding. The capacity depends on i.e. the tray dimensions, for example 350 trays per hour. The baking paper is released from the roll (1), cut and placed onto the tray. Length (L) of the tray, for example 800 - 2000 mm. Width of the tray/paper for example 400 - 800 mm. In one single 700 mm paper roll there is more than 7 km paper. The paper used for this purpose is generally silicone covered on both sides (41 g/m2). 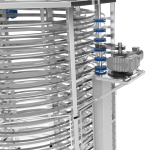 The ultra-hygienic Promax spirals are easy to clean and maintain as well as offering a good overall economy due to their construction. They are also very quiet when in use. 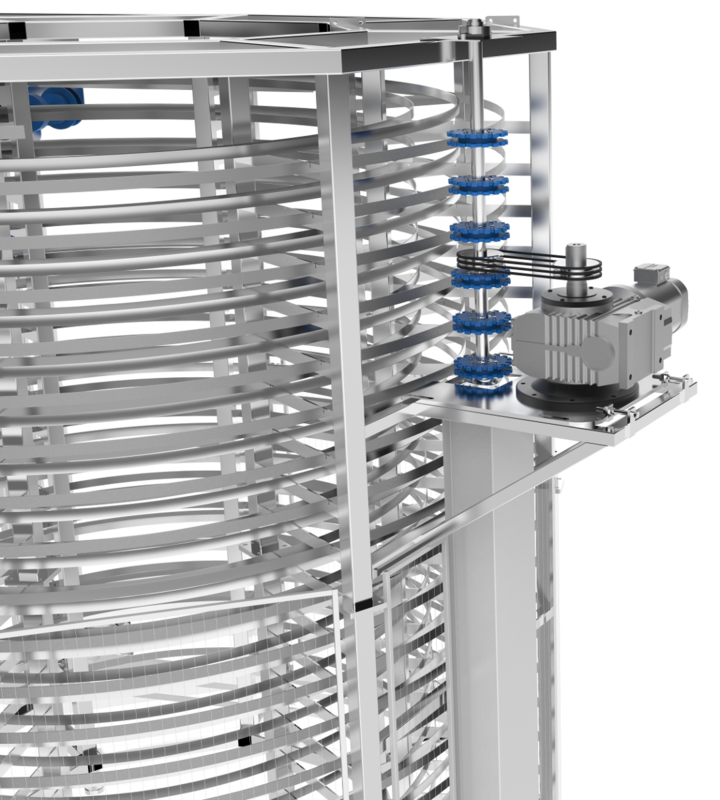 The spirals do not contain an inner drum which frees up floor space in the production facilities. Such space can be used for other purposes such as cooling. Quick and easy assembly significantly shortens the overall startup time.